For customer service, call us toll-free at 1-800-319-4834. For customers outside the US, please call 1-404-728-8787. International calling rates will apply. What type of flight do you need? Low fare note: To increase your chances of finding low fares, leave the following unselected. A no preference search covers those airlines to which Expedia has access, which is most airlines. The flights displayed are those for which Expedia was able to confirm availability. By searching for flights on just one airline, you may be able to find additional choices and possibly even lower prices. Whether you are looking for a relaxing weekend getaway, a family adventure, or in town visiting family or friends, Sacramento is one of the best visitor values in California offering well-priced hotel rooms and world-class attractions. California's Capital City is bustling with great restaurants, shopping and cultural arts. Follow the history of the Gold Rush. Go adventuring on our rivers and bike trails. Do a little wine tasting at one of 200 local wineries. Enjoy California cuisine, made from the freshest ingredients straight from local farms in "America's Farm-to-Fork Capital." 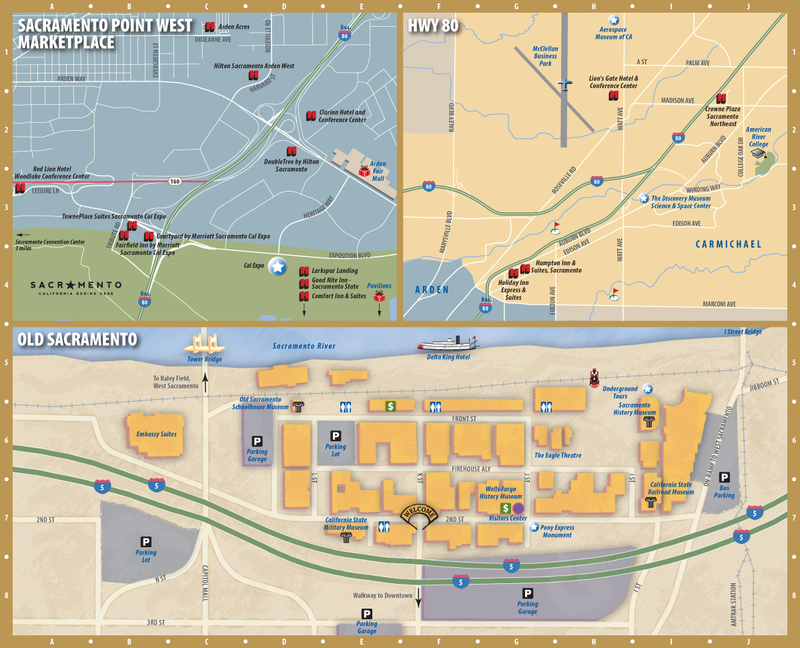 Whether you visit for business or pleasure, you'll find great deals right here on business- and family-friendly hotels and accommodations throughout the Sacramento area. From budget to luxury … quaint to ultra-modern, these featured hotels offer the full range of options. Terms and conditions: Special offers are only available at participating hotels. Prices shown above include applicable discount. Hotel savings are based upon Expedia's everyday hotel rates, excluding taxes and other fees. Minimum stay may be required. Offers are subject to availability and may be discontinued without notice. Additional restrictions and blackout dates may apply. Winter in Sacramento is nothing if not atmospheric, and a short walk on a gauzy morning along our American River Parkway will make the point. Prime season for ground fog—which Sacramentans term “tule fog” after the reeds that grow in Central Valley wetlands—is December through February. Not every morning is foggy, but we’ve come to appreciate those that are. Sacramento has more coffeehouses than anywhere south of Seattle…or maybe Portland. Temple Coffee gets its beans from around the globe. The Alley, on a downtown side street, is a local favorite. Fluid Espresso, highly regarded for its house-baked goods, also serves empanadas and burritos. The Sacramento Ballet's most popular presentation, Tchaikovsky's "The Nutcracker," has pleased hundreds of thousands of attendees. The holiday tradition dances across the Community Center Theatre stage Dec. 6–21. What better for a cold, cloudy day than a visit to an independent bookstore? Time Tested Books, The Book Collector, Beers Books and The Avid Reader, all in the downtown area, have storied histories and inspired inventories. Whether your interests lean toward art, railroads, aviation, automobiles, history, science, nature or medicine, the Sacramento area has a museum for you—more than 20 of them, in fact. Looking for a jump-start on things to do when you've unpacked your bags? Meetup.com will put you in contact with like-minded souls sharing every special interest imaginable, from yoga to dance groups to dogs and Tai Chi. Sacramentans are brunchers, and the choices are many and varied. Fox & Goose offers a taste of England with choices like bangers and crumpets, while Bacon and Butter says it all with dishes like the Kitchen Sink, a calorific fave. Tower Café, so popular you’ll have to wait in line, features an internationally inspired brunch menu. Gold is what put Sacramento on the map, and if you're looking for a bit of Gold Rush history, a visit to Sutter's Fort just may be the ticket. This restoration of city founder John Sutter's original outpost, built in 1839, achieved notoriety for sending aid to the beleaguered Donner Party. Check the website for a schedule of living-history days. Sacramento's got talent. Marilyn's on K, Harlow's and The Torch Club are just three downtown nightclubs showcasing the best of local talent as well as big-name touring acts. Sacramento's oldest neighborhood, Oak Park, dates to 1887 and offers a couple of winter warmer-uppers. Drop in to Old Soul at 40 Acres for a hot cup of java and browse the shelves at Underground Books. For some grub to heat up the tummy, Original Po Boys dishes up spicy Cajun favorites. Migrating birds by the multitudes hug the Sacramento River in winter, and on an invigorating stroll along the riverfront, you're also likely to spot beavers, otters—and maybe an errant sea lion or two. 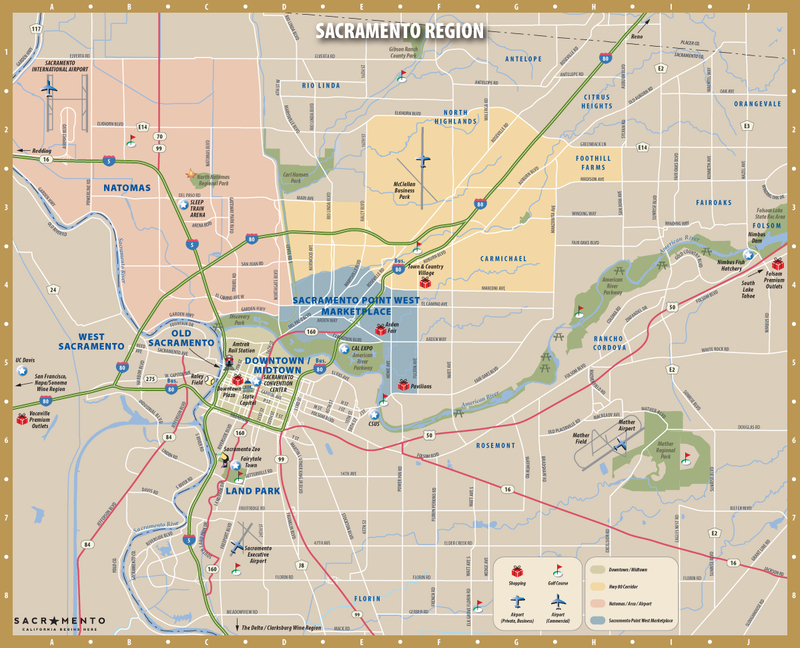 Sacramento is one of California's most accessible major cities. Arrive by air, rail, highway and even water. 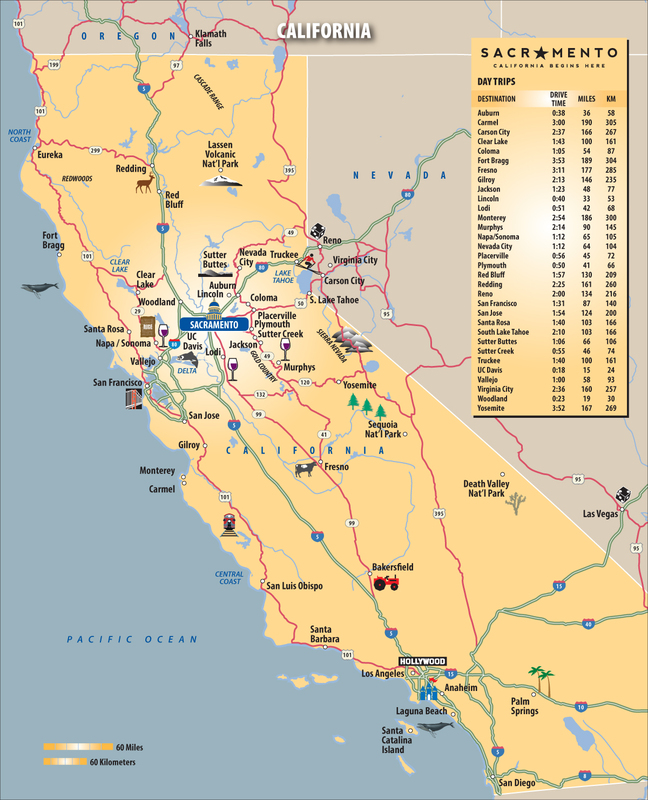 We're located just 90 miles from San Francisco and Lake Tahoe and just 50 miles from Napa. 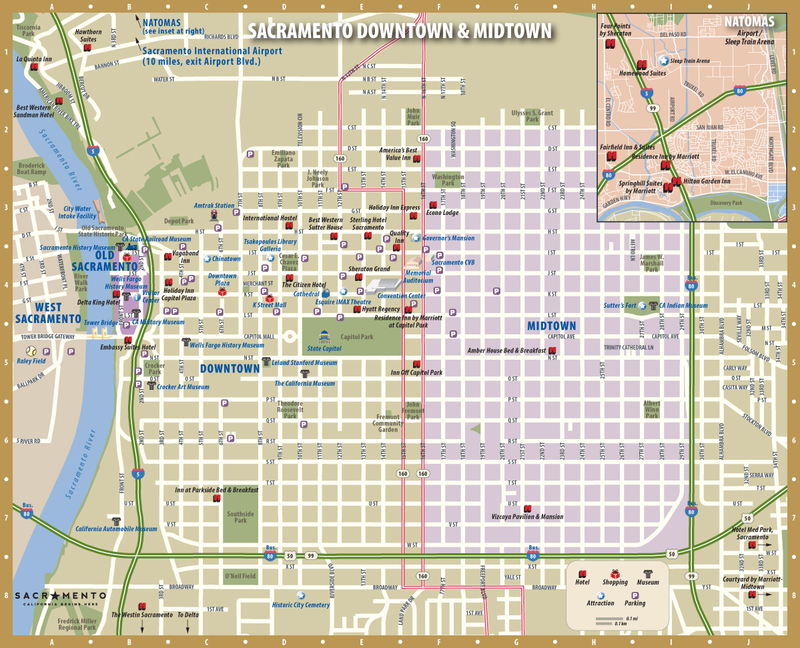 Find complete Sacramento maps & transportation options below.